I bet you’ve seen the NVIDIA Tegra 2 moniker been thrown all over the place these days. CES 2011 is over now and we saw a slew of smartphones, tablets and whatnot’s powered by Nvidia’s latest and greatest mobile platform. So what’s all the fuss about it and how high should you place your expectations for your next dual-core smartphone? It sure sounds like the next best thing in the business and we’re more than happy to serve your curiosity by delving deeper into what stands behind this label up there. Although it sure looks like a computer CPU, the Tegra 2 chip is more complex than that. It’s packaged the same way, however inside it there is an ARM Cortex-A9 dual-core processor, 1MB worth of shared L2 cache, an ultra-low power GeForce GPU and as many as five other co-processors that help the dual-core big-boy do its job most efficiently. Unfortunately, the current crop of mobile processors have hit a bump in their development. Pumping the clock rate and cache can only get you so far before any further voltage tweaks start sucking your battery’s juice in less than a day. Enter dual-core platforms where multitasking is distributed evenly between the two cores thus allowing more flexibility in multitasking helped by capable dedicated processing hardware for specific tasks such as gaming and HD video playback and recording. 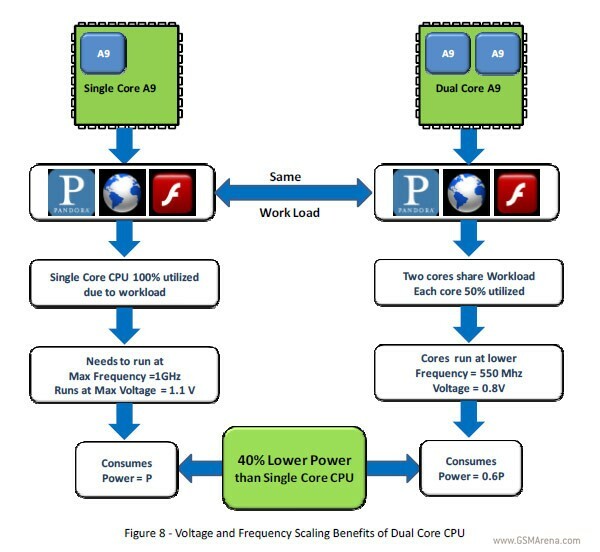 It’s much the same path desktop CPUs took from single-core to dual-core five years ago. 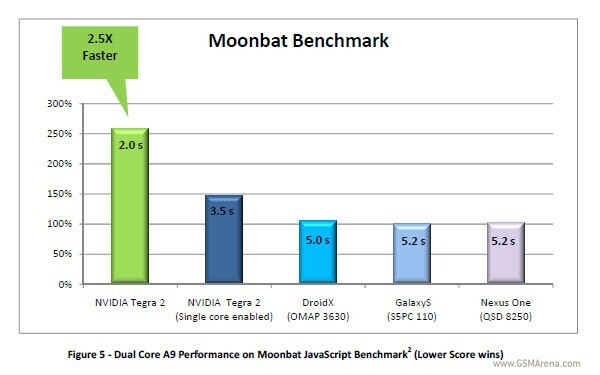 Without getting into the technical side of things any further, here’s how fast the Tegra 2 is in a synthetic benchmark against some of the Android competition. The dual-core architecture brings a total of 30% faster page load times as compared to the same configuration but with only one core enabled. That should give you a pretty good idea of the expected comparative performance gain regardless of custom architecture and OS. There’s more to it, right? The world of mobile devices is increasingly becoming gaming-oriented and much like on the market of the bigger consoles, whoever has the best games and gameplay wins the biggest share. So far Android has been rather limpy on the gaming side despite the serious hardware we’ve seen implemented lately. Nvidia promises to change that with mobile gaming performance that might just put Android OS on the gaming map. The Tegra-powered Optimus 2X is among the first smartphones to offer the power of Tegra2 to the consumer and Nvida picked it to showcase the Unreal 3 engine powered game Dungeon Defenders (soon to be available in the Android Market). 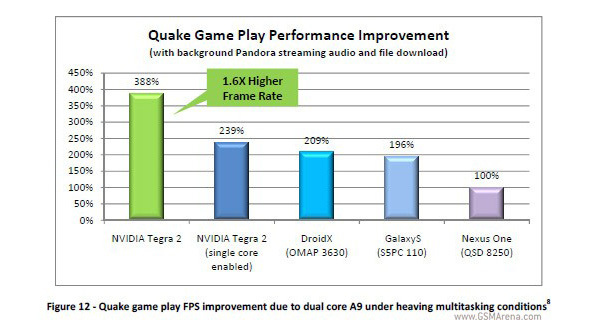 Other mature video game engines could also benefit from Tegra 2 dual-core prowess such as iDTech 5 (Doom 4 and Rage) and Frostbite (Battlefield: Bad Company). So Android OS may finally be meeting Apple’s iOS devices heads-on on the mobile gaming front. Does it burn more fuel? The problem of power consumption can be felt easily with the current crop of power-hungry phones. 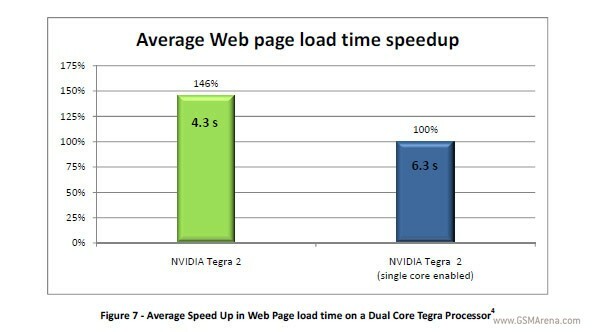 According to Nvidia, since the Tegra 2 system can process concurrent tasks with both cores simultaneously, it usually completes intensive tasks in less time so it spends less time at maximum clock rate. Plus when it’s not needed, it can turn off one of the cores to reduce the power needs. This is supposed to result in almost 40% lower total power consumption compared to old-gen Cortex A8 SoCs for one and the same task of loading a webpage. Ranging from car head units to set-top boxes through tablets to uberphones, Nvidia Tegra 2 is already implemented into numerous devices by multiple manufacturers. This year’s CES saw numerous product announcements about it – most of which due as soon as Q1 2011. There’s no doubt that the Nvidia Tegra 2 is an exciting platform for ARM-based tablets and smartphones. The premium multimedia features such as 1080p video playback, HDMI support, Adobe Flash streaming hardware acceleration and the good performance with popular gaming engines is a surefire way to success. Especially while the competition doesn’t have anything nearly as powerful deployed right now. Qualcomm is NVIDIA’s main competitor when it comes to mobile dual-core CPUs but we are yet to see what their dual-core Snapdragon platforms are capable of. The third-generation Qualcomm MSM8260 and MSM8660 SoCs will both have two cores running at 1.2GHz. Those will also have the latest generation of the Adreno graphics chip, called the Adreno 220. The main difference between the two is that the MSM8660 is capable of multi-mode HSPA+/CDMA2000® 1xEV-DO Rev. B, while the MSM8260 sticks to HSPA+ only. Update 12 Jan: Texas Instruments also has its dual-core ARM Cortex A9 product line, called OMAP4 and it will be a direct competitor to the Nvidia Tegra 2. I’m sorry I left that out yesterday. The TI OMAP4430 is already out to manufacturers. Both of its cores run at 1GHz. The other product – the TI OMAP4440 is not ready just yet but should get to manufacturers this quarter. Its cores run at 1.5GHz. Both of the OMAP4 products make use of the help of a graphics acceleration core, the PowerVR SGX540. There’s also a multimedia accelerator processor (IVA 3), which not only crunches plain 1080p video encoding and decoding easily, but it also allows for encoding and decoding real 3D HD video. The platform can make use of up to two stereoscopic cameras (of up to 12 megapixels for the TI OMAP4440) so I guess that 3D will be a differentiating factor for the TI OMAP4 platform. But that’s in store for the future. 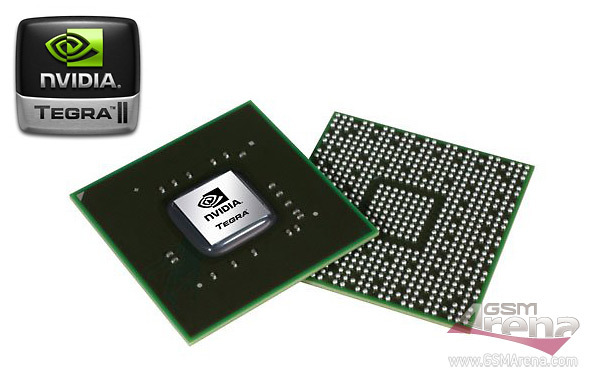 For now, we just can’t wait to get our hands on one of these Tegra 2 babies and test the hell out of it.